I met Max in London when he came and talked with those of us who were doing the first AIDS mastery weekend with Nigel Hughes and Sally Fischer. The last time I saw Max he looked pretty sick but was enthusiastically assisting the lad who was pushing his wheelchair through the streets of Washington D.C. on the Big March of 1986. I wish him buckets of white light. Roderick himself has now died of an AIDS-related condition and a panel for him is on Block 8. Funny to find Max on a New Zealand quilt. I’m assuming this is my Max from NYC, NY. Originally from Massachusetts, Max began life as Michael Hurlebus – we came up with the name that fit him late one night in the 1970’s. Max was an artist and an activist. What didn’t he do? The man designed some wonderful multi-functional furniture, did some interior design, decided to write a play and it was pretty damn good. Played a mean saxophone and sang with marvellous style. I’m not sure if he didn’t use both these names for his combo at one time or another: MAX NAVARRE and The Wallets & MAX NAVARRE & the Combo Platter. Everything he attempted he did well. I used to be bothered by his seeming inability to keep at one pursuit for any length of time – as I felt he could succeed at any one of them. After he died it hit me that he really didn’t have the time to pursue anything in depth so he leap-frogged from one to another – always with such beauty and style. I always fancied him a Noel Coward – and certainly, in many ways he was. I adored Max. We spread his ashes in Nyack, NY at Hook Mountain Park. I love this quilt panel. It would make Max smile. And laugh. Theresa sent us this information about her uncle. Max Navarre was my uncle. We were only 12 years apart in age so to me he was more of a cool, hip, older brother than an uncle. To add on to Karen’s comments…He did begin his life in Massachusetts, South Boston actually and his given name was Michael F. Hurlebaus; he was the youngest of 5 children. My mother Carolyn was one of his older sisters and she just adored him. Boston was too small of a city for him and his dreams so when he graduated from high school he hit the road for NYC and never looked back. The stories he would tell me of his ‘adventures’ in the ‘big city’ could fill a book… of course, he would need to be the one to write it because he was the wordsmith in this relationship! My uncle was a remarkable man, gifted in so many ways. I, too, used to wonder at why he didn’t seem to stick to one pursuit for a great deal of time however when he got sick I realized how short life really is and how much he would have missed doing if he had lived his life any other way. He died on May 28, 1988 – two months shy of his 34th birthday; passed away on his father’s birthday. They weren’t exceptionally close but I like to think my grampa was there to welcome my uncle when he left this world for one free of pain and illness. 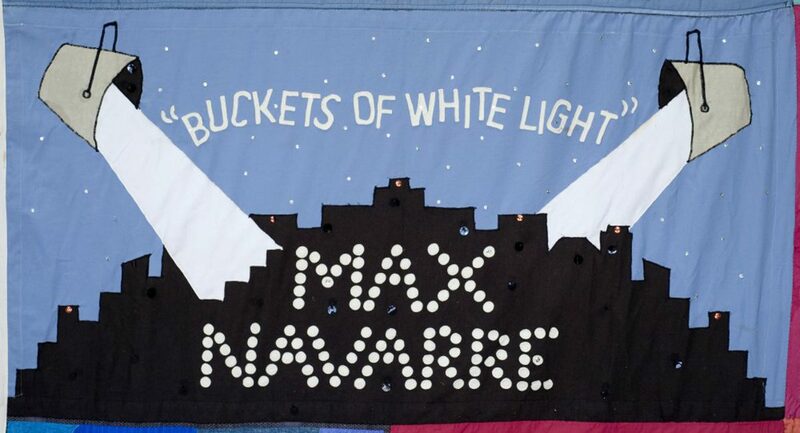 The world is a little dimmer, even now after all these years but I love this image on the NZ quilt panel for him because he shone the light on everyone and continues to shine down his brilliant light on all of us.